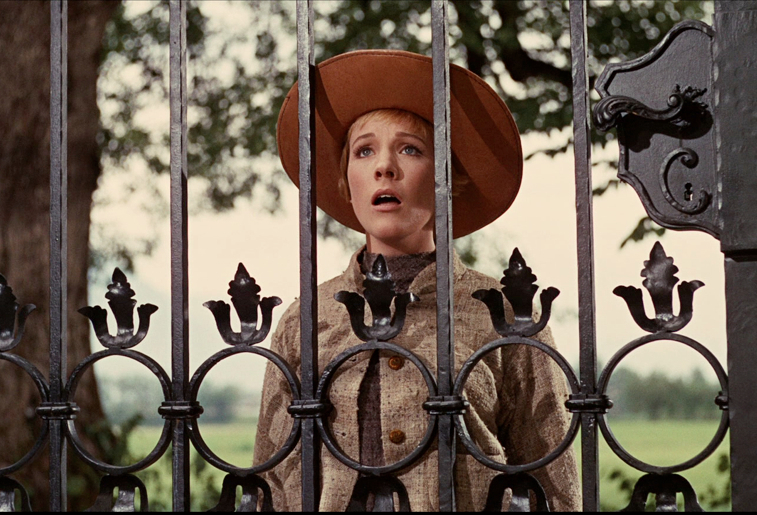 Julie Andrews in Robert Wise’s “The Sound of Music.” Courtesy of Twentieth Century Fox. It all starts with that helicopter shot. The Twentieth Century Fox logo twinkles in silence before fading out, as a billowing wind starts to sound. Suddenly, the audience finds itself swept through the clouds, over the majestic vistas of Salzburg, Austria, so tranquil and inviting prior to the Nazi occupation. It is this ideal homeland, covered in edelweiss, that will somehow manage to survive the unimaginable horrors in its imminent future, even after losing many of its cherished inhabitants. As he did in the opening moments of “West Side Story,” director Robert Wise provides us with a god’s eye view of the setting before conflict begins to engulf it. Slowly, traces of melody start to echo through the mountains, as if in anticipation of the towering showstopper on the horizon. Sure enough, a grassy hill materializes in the sunlight, and a woman walks briskly across it, overwhelmed by the sheer beauty of her surroundings. The camera closes in as she lifts her arms, twirls, opens her mouth and belts out her first note of tuneful euphoria, thus beginning my favorite performance in the history of cinema. March 2nd marks the 50th anniversary of Wise’s Oscar-winning classic, “The Sound of Music,” one of the most successful and beloved films ever made. It is also among the most satirized, with one of the earliest parodies featuring none other than Julie Andrews two years before she was cast as Maria von Trapp. She performed the sketch, “The Pratt Family Singers,” with Carol Burnett at Carnegie Hall, where she displayed the astonishing vocal range and impeccable comic timing that would earn her the Best Actress Academy Award for “Mary Poppins” a year later. Whereas Mary is a magical nanny whose sole purpose is to repair troubled families, Maria is a nun who simply wants to fit in at her convent, but God has other plans for her. The task of caring for seven children is imposed on her, and the anxiety that Andrews conveys is crucial in humanizing a role that could’ve easily become saccharine. Her neuroses reach their comedic heights in her second big number, “I Have Confidence” (a song hilariously referenced in the opening lines of “I Believe” in “The Book of Mormon”), which Andrews performs with marvelous faux bravado. “With every step I am more certain!” she declares just before stumbling off a bus. “Oh help,” she groans while facing the Von Trapp mansion before taking a deep breath and charging toward the front door. Her exuberance here is so infectious that she’d make a believer out of anyone, let alone herself. When I was a kid, Andrews personified the perfect maternal figure: warm, nurturing, free-spirited, unconditionally loving. Coaxing the Von Trapp children out of their respective shells was not her “duty,” it was her joy. Ever since its Broadway debut in 1959, countless actresses have tried to capture the benevolence and uncynical beauty of this role with varying degrees of success. 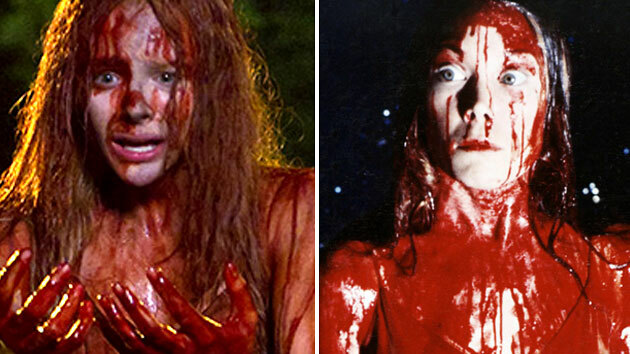 With Andrews, it never felt like an act. There was no irony in how she regarded the children as if they were her own, nor in how she grew ashamed of her repressed feelings for their father. Just look at her during the scene when he dances with her and they pause as their eyes lock, sharing a wordless discovery of the love that has stealthily blossomed between them, causing her to break away in a haze of confusion. The multitude of emotions expressed in that single, fleeting moment is absolutely breathtaking. In her revealing 2008 memoir, Andrews recalled her memories of the London Blitz, a traumatic experience that undoubtedly lent added authenticity to the climactic passages of “Music,” where Maria calms the children as they hide from the Nazis’ piercing flashlight beams. Roger Ebert once wrote that nothing moved him more deeply in a film than “goodness and kindness,” and Andrews embodies both qualities with such radiance that she positively glows. Christopher Plummer rightly observed on the film’s 40th anniversary DVD extras that with this film, Andrews “seduced the world,” and this, of course, proved to be a double-edged sword. It quickly became apparent that many audiences would be unwilling to accept her as anything other than a musically inclined nanny. While reluctantly working with her during the rocky production of 1966’s “Torn Curtain,” Alfred Hitchcock was downright cruel, dismissing the acclaimed actress as a one-trick pony (“The audience will be waiting for her to start singing”). Had he not seen her excellent work in Arthur Hiller’s song-free satire, “The Americanization of Emily”? Had he also forgotten the miraculous performance he managed to elicit from Doris Day, of all people, in “The Man Who Knew Too Much”? Regardless, this bungled collaboration remains one of the most infuriating missed opportunities in the Master’s career, and it came at a time when Andrews—hot off her two massive hits—was seeking to stretch behind the boundaries of her now iconic persona. She’d have other good roles—1982’s “Victor/Victoria” and 1986’s criminally under-seen “Duet for One” are prime examples—but none came close to equalling the impact of her Maria von Trapp, which continues to be embraced by new generations. Roughly a decade ago, I saw Andrews speak about her career in an installment of Columbia College’s “Conversations in the Arts” series. It was a glorious evening that I wished would never end. I’ll never forget her story of filming on the hill, and how its seeming blissfulness was an illusion, to say the least. Every time the helicopter flew toward her, enabling the camera to acquire a close-up of her twirling body, it would blow Andrews to the ground, leaving her to cough up mouthfuls of grass after each take. Finally, she decided that she couldn’t take it any longer and caught the attention of the pilot. She moved her hands in a circle while asking him if he could possibly make a wider turn, so as to prevent the hills from coming alive with the sound of yet another face plant. Interpreting her gesticulations as little more than an animated statement of “Good job,” the pilot smiled and responded with an upturned thumb. My guess is that the words brewing in Andrews’ head at that moment would be the sort of language unapproved by Rodgers and Hammerstein (though they certainly wouldn’t be out of the question for Trey Parker and Matt Stone). Four years after the devastating loss of her singing voice, courtesy of a botched surgery, Andrews was rapturously celebrated at the Kennedy Center Honors. She was treated to a medley of various songs, many of them from her celebrated career on Broadway. Carol Burnett gave a droll introduction, and the singers included Kristin Chenoweth, Robert Goulet, Jeremy Irons, Patrick Wilson, Rebecca Luker and Audra McDonald, whose portrayal of Mother Superior was the sole redeeming element of 2013’s otherwise execrable “Sound of Music LIVE.” For the rousing finale, the singers grouped together onstage and sang the last few lyrics of—what else?—“The Sound of Music,” culminating with the line, “And I’ll sing once more.” The poignance of this moment was off the charts. By then, Andrews knew that, in all likelihood, she would never sing again, and yet, this night served as the ultimate reminder that her legacy was immortal and her voice would continue to be heard, thanks in large part to the ageless power of cinema. Andrews visibly struggled to maintain her composure during the final sustained note, holding back tears before leaping to her feet, applauding the performers, as the entire theater stood to give her an exultant ovation. When fellow honoree Jack Nicholson offered her a tissue, she proceeded to blow her nose with cartoonish zest, eliciting laughter from the crowd. Such a gesture speaks to the person Andrews is. She’ll keep on creating and entertaining regardless of the setbacks she’s endured. Her resilience is akin to that of Salzburg and her spirit is akin to that of Maria. I’ll always have confidence in her. “The Sound of Music” screens Thursday, March 26th, at the opening night gala of the 2015 TCM Classic Film Festival at the TCL Chinese Theater in Hollywood, with Julie Andrews and Christopher Plummer in attendance.